Mass Save is a residential energy program sponsored by our local utility, National Grid (electricity). It offers economic incentives to its residential customers to make improvements to their homes to reduce their energy consumption. The program offers many "no-cost" incentives that are paid for by a surcharge included in our monthly electric bills. Nearly all Nantucket residents qualify for the Mass Save program because, with few exceptions, we all get our electricity from National Grid. The program offers no-cost home energy assessments, free LEDS to replace incandescent bulbs, subsidized insulation, free air sealing (as part of insulation installation), rebates on space heating and hot water heating equipment, and a 0% loan program for qualified home energy improvements. Why do the utilities want us to reduce our home energy consumption? Although it may seem counterintuitive for the utilities to offer customers a program to reduce energy usage, they have a real economic incentive to do so. If energy usage continues to rise at its current rate the utilities will be forced to build power plants or buy energy from other sources to meet the demand. Both of these options are risky and expensive. In addition, the utilities are required by Massachusetts state law to provide energy efficiency programs and to employ demand reductions strategies before adding new supply in order to meet public’s need for energy resources. The Mass Save Residential Energy Program is part of the conservation strategy to help reduce the rising demand for energy. It offers homeowners economic incentives to make their home more energy efficient thereby reducing energy consumption and energy costs. How can I participate in Mass Save? All homeowners who wish to take advantage of Mass Save funded energy upgrades need to first schedule a no-cost home energy assessment. Mass Save calls it "no-cost" vs. "free" because all utility customers pay for it through a surcharge on their utility bills (~$65/year for an average Nantucket home). Insulation in your home’s exterior walls, attic and basement. The assessor may use of an infrared camera to help detect insulation levels behind finished walls, floors and ceilings but only as weather permits. It needs to be cold or warm enough to maintain a 10-15 degree temperature differential between indoor and outdoor temperatures in order for infrared camera readings to be effective. Mold, moisture and mildew problems in the basement and attic. The efficiency and efficacy of combustion appliances such as furnaces, water heaters, and gas ranges. Compact Fluorescent Lightbulbs (CFLs) in high use areas. The Mass Save program offers hard to find CFLs for specialty fixtures such as candelabra or three-way switching. Flow-reducing faucet aerators. An aerator is a simple device that screws onto the spout to mix air with the water to reduce the GPM (Gallons per minute). The assessor will also provide a report summarizing the findings of the audit. S/he should review the report with you, and explain what energy upgrades your home qualifies for under Mass Save as well as the process for implementing these upgrades. Qualified energy upgrades, including air sealing and insulation, will not be installed during the assessment. You will need to schedule follow-up appointments for these. What about weather-stripping and air-sealing? Aren't these included in a home energy assessment? The energy assessment does not include air sealing. If the home qualifies for subsidized insulation, air sealing may be provided when insulation is installed (see below). Air sealing should not be confused with weather-stripping. Air sealing prevents air infiltration between fixed assemblies in your home, such as a foundation sill plate or wall top plate in an attic. Weather-stripping prevents air movement through operable parts of doors and windows. The Mass Save program does not include any weather-stripping, which can be installed easily and economically either by a homeowner or a handyman. Our referral list includes carpenters who can do this work. The home energy assessment also does NOT include a blower door test to measure the home’s air tightness. If your home qualifies for insulation, a blower door test will be performed during installation. "Just had our energy audit. Got four programmable thermostats and new lightbulbs for the whole house, which totalled over $800! " 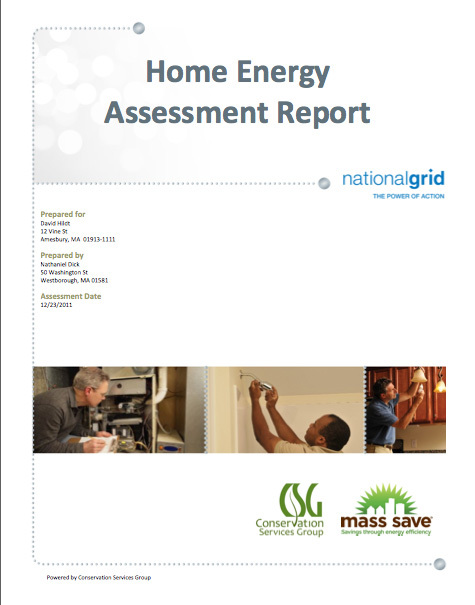 Sample Home Energy Assessment Report. CLICK on Image to view or download. If you are interested in residential programs, select "For Your Home," then select a category (Lighting & Appliances, Income-Eligible, Heating & Cooling, Building a House or Addition) to see the energy savings programs available to you. Each program has a link with more information about how to apply. Can you explain the incentive for insulation? 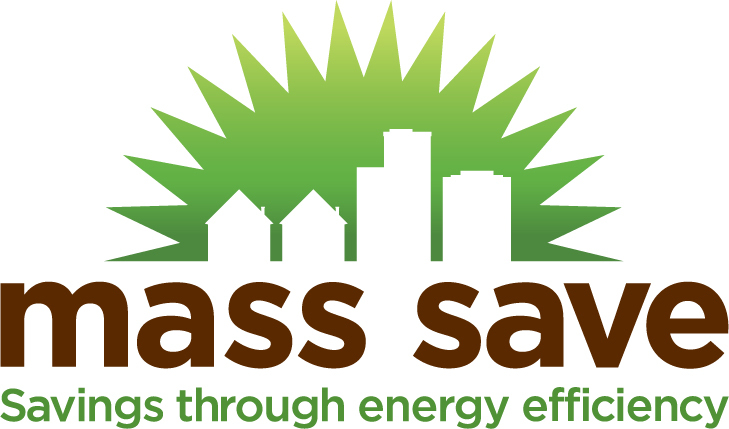 The Mass Save program subsidizes the cost of installing insulation in existing homes that are not adequately insulated, as determined at the home energy assessment. Qualified homes receive a 75% subsidy on the cost of insulation up to $2000 per year. This discount is deducted upfront, so the homeowner only pays 25% of the cost up to $2000. The homeowner is responsible to pay in full any cost above $2000. However, because the $2000 limit is per year, you could spread an insulation job that costs upwards of $2000 over multiple years. For example, a homeowner with an insulation contract for more than $2600 can spread the work out over two years to take advantage of the 75% subsidy each year. However, this strategy will require a new home assessment for every year the subsidy is requested. I've heard that the insulation subsidy doesn't cover all types of insulation. Is that right? Yes, that’s right. The Mass Save insulation subsidy covers only cellulose insulation and fiberglass batt insulation. It does not cover any spray foam insulation. Depending on your home, spray foam may do a better job of improving your home’s energy efficiency than cellulose or fiberglass batts. If you have any questions or concerns about insulation strategies for your home, we strongly recommend that you consult with a local energy specialist who can help you choose the right insulation material for your home as part of an overall plan to improve your home’s energy efficiency. So what about free air-sealing? Is this included with insulation? Air sealing is provided in attics only when subsidized insulation is also being installed. Air sealing in the basement is provided only when subsidized insulation being installed in other parts of the house. What are the incentives for upgrading heating and hot water equipment? Up to $300 a new high-efficiency oil or propane indirect-fired water heater. Between $50-$700 for high-efficiency gas water heaters. Heating equipment and hot water equipment rebates can be used in conjunction with the 0% HEAT Loan program. What is the 0% "HEAT Loan"? 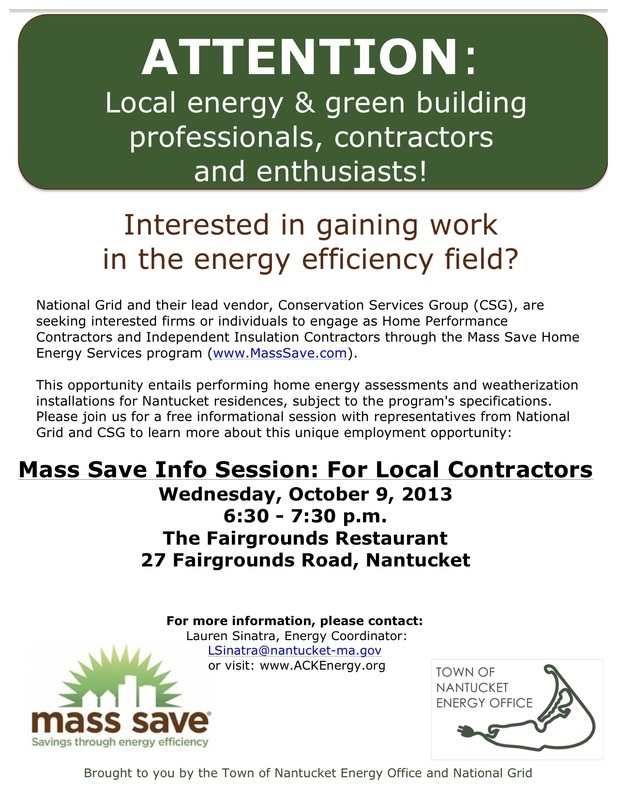 The Mass Save Program offers a 0% loan program for a number of home energy improvements. The equipment and installation must be qualified by the auditor on the ‘Heat Loan Intake Form’ in the report packet issued at the home energy assessment. The packet also includes a list of the banks participating in the program. Energy Star Window replacement materials and installation. Insulation/air sealing material and installation costs (exclusive of the Mass Save subsidy). Duct sealing and duct installation. To qualify for a HEAT Loan the bank will require a homeowner to have a certain credit rating. Ask the banker what rating they require. Work done under the HEAT Loan program, except for insulation and air sealing, does not require contractor certification by National Grid. Any licensed contractor qualified to perform the work can be used. This means you can use your plumber or HVAC contractor to replace your heating or domestic hot water system. Just be sure they will provide the paperwork required by the lender. My home was identified as having "health & safety barriers" to participating in Mass Save. What do I do now? Knob & tube wiring. Often older homes have remnants of a Knob & tube wiring systems that was widely used when houses were first wired for electricity. The system is considered a fire hazard. It must either be removed and replaced if it is ‘hot’ or certified by a licensed electrician as being ‘dead’ or disconnected. It is not uncommon to find knob and tube in houses in Nantucket built before 1940. Most often it has been abandoned for many years. Typically it is simply a matter of hiring an electrician to inspect the wiring and verify it is no longer in use. If the extend of the Knob & tube is limited, it should cost a few hundred dollars. Asbestos: Asbestos was used widely to insulate heating pipes and can be found in other building materials including some forms of insulation. Asbestos is considered a Hazardous material and must be removed through a certified abatement process. Again the presence of this material is not uncommon in older homes in Nantucket. Usually the material can be isolated and removed quickly and easily for a few thousand dollars. Moisture/mold: During an assessment the auditor may discover the presence of moisture, mold or mildew that the homeowner was unaware of. The source of these problems may not be apparent and may require consulting professionals to flush out the real source of the problem. Sometimes it is hard just to figure out who to talk to. If the problem is in the attic, most likely there is a leak in the roof. Mold and mildew just above the ceiling is often a result of moist air from inside the house escaping into the attic. Basement moisture typically results from ground water coming in through the foundation or the concrete floor slab. If you need a general consultation to review the problem go to a general contractor or architect versed in sustainability issues. They should be able to advise how to proceed. High Carbon Monoxide Levels: The home assessment includes testing the combustion equipment in your home for air quality problems. Combustion equipment includes anytime that requires a flame to operate such as gas or oil fired boilers or furnaces, hot water heaters, gas clothes dryers, ranges and ovens. High levels of carbon monoxide are unsafe for the occupants and must be addressed. Often the equipment needs to be cleaned or a tune-up. Your regular service contractor can do it. If the problem is ventilation the service contractor may be able to deal with it or a HVAC contractor should be consulted. Vermiculite: this is a type of loose fill insulation commonly found in attic floors. It is known to contain Asbestos particles and therefore requires disposal by a certified abatement process. Most Asbestos abatement contractors can remove Vermiculite as well. Isn't there also a rebate for recycling my old fridge? National Grid offers a $50 rebate for recycling a second household refrigerator or stand-alone freezer. For a free pick-up call 877-545-4113 or visit www.MassSave.com/recycle. In order to get the rebate you must have another primary operating refrigerator, and the unit to be recycled must be clean, in working condition, and 10-30 cubic ft.